The USDA Commodity Foods program supports nutrition assistance to schools by providing high-quality meats, dairy, and produce products at minimal cost. The USDA purchases food from farmers and growers across America and then makes it available for purchase, at a reduced cost, to public agencies like school districts. However, many charter schools have no awareness of the program. The few that do usually cannot participate because they lack the capacity to effectively order, process and store large amounts of food for their students. 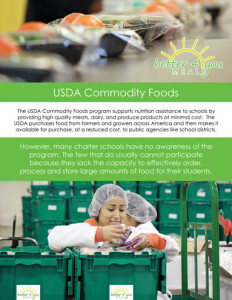 In 2011, REAL Journey Academies founded the Charter School “Cooperative” (Co-op) making it possible for California charter schools to participate in the USDA Commodities Program and collectively benefit from significant cost savings. The vision of this Co-op is to provide California charter schools with the opportunity to receive monetary credits by incorporating USDA Foods their meals program. The Co-op is now managed by Schools in Action School Food Program (SIA) based in Los Angeles. SIA works with B4YM to manage all logistics involved in getting the finished meals to your students. B4YM receives no compensation from SIA or any Co-op schools for utilizing or processing of and USDA Foods. There is no upfront or out of pocket cost to your charter school to participate in the Co-op. A single page application and MOU are the only required forms for entry. The Co-op staff will handle all paperwork, order the food, arrange transportation, and monitor compliance. Better 4 You Meals as a State approved processor will pick up, store and ensure the safety and quality of all purchased food. Each school member receives regular reports on food ordered, including their projected credit statements. The Co-op and B4YM take advantage of all commodity purchase opportunities, therefore maximizing the monetary credit available to your organization. Currently, over 75 charter schools participate in the Co-Op for 2018-19 and they collectively have almost $1 million dollars in monetary credits available to their schools. Download the B4YM USDA Commodity Flyer by clicking on the icon here.